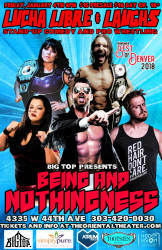 Featuring "Yoga Monster" Mike Sydal, Dak Draper, Lonnie Valdez, Darin Corbin, Ruby Raze, Allie Gato, and more! Headlining comedian Nancy Norton. Featured comic Rick Bryan. Color commentary by Nathan Lund and Sam Tallent.